The outer buoys to St. Marks are not as far out in the Gulf as the other rivers we have explored, but it is still some distance from the first set of markers to the town itself. The distance from river entrance to river entrance was 54 miles after heading due west out of the Steinhatchee to avoid a large shoal, and then turning north to reach St. Marks. 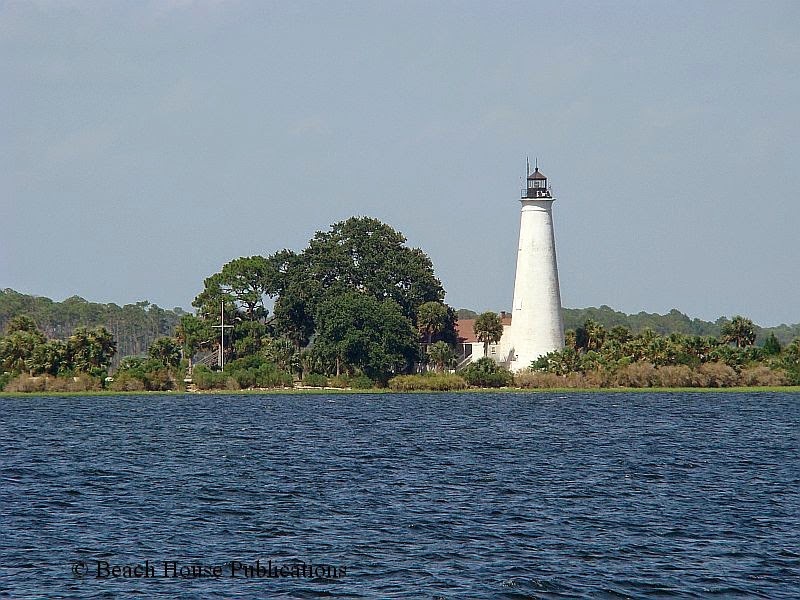 The lighthouse stands guard at the the river entrance with marsh land beyond. Farther upriver, the marsh and forest begin to combine to make for a very scenic cruise. Some boaters have anchored just off the lighthouse, but we found this less than desirable in anything other than calm conditions. It's wide open to the Gulf and the southerly afternoon seabreeze, making for a bumpy location. We took the time to check out the other fewer anchorages available on the river. Much of the river bottom is rocky so there are only a few places we felt comfortable adding to our anchorage book. The next morning the forecasts looked good and the plan was to explore a new location for us, Alligator Harbor. This would still be a 44 mile day by the time we headed back down river and made the crossing to the harbor. The channel to get into Alligator Harbor can be a little tricky, but it is well marked. 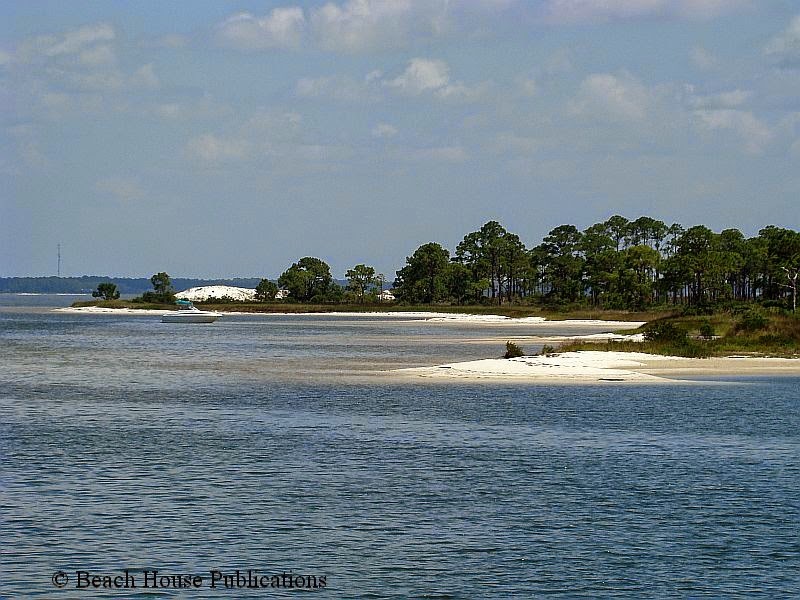 It required us to cruise along the outside of Alligator Point and stay within the channel with shoals on both side. Once around the western tip, the harbor opens up and is wide, but mostly shallow. Following the marked channel on the inside, we found a deep pocket just out of the channel and at 3:00 p.m., Beach House was secure on her anchor behind a thin ribbon of beach. The afternoon seabreeze blowing off the Gulf and the sounds of the waves lapping not far off our bow made for a perfect end to a perfect day. This is another anchorage we planned to include in the Gulf Coast anchorage guide and the next day we would be spending most of our day going from one potential anchorage to another. But for this evening, we just enjoyed where we were. The next morning we reversed our course out of the harbor and pointed the bow toward Dog Island. Odd how such a fantastic island could have such a strange name. During the course of the day we visited and sounded 5 separate anchorages and really wish we could have stopped at every one. Weather delays have put us far behind so it is necessary to keep moving along. After a thorough exploration of Dog Island which included 5 hours of zigging and zagging, we headed across the sound to Carrabelle. It was only 1:50 p.m. when we arrived so some shore time was needed. The last time we were here was by car and we wanted to visit one of the restaurants we liked, The Fisherman's Wife. We were not disappointed and the shrimp, which comes off their own boat, was excellent and just as delicious as we remembered. We also took some time to stop by "the porch" at C-Quarters Marina and visit with the locals while enjoying a sundowner. Another perfect day. 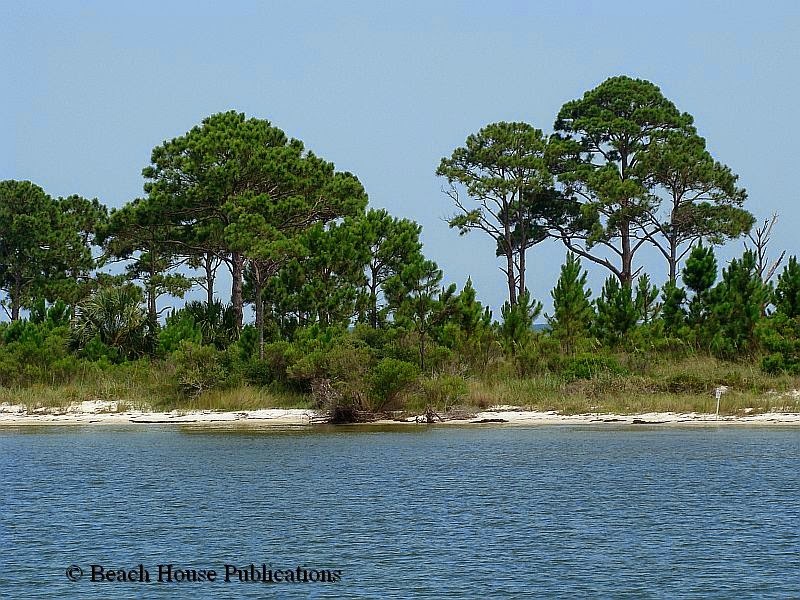 From Carrabelle, it was deja vu all over again as we spent the day in the anchorages around St. George Island. So far the weather had been very cooperative with light breezes, calm seas and most importantly, no thunderstorms. 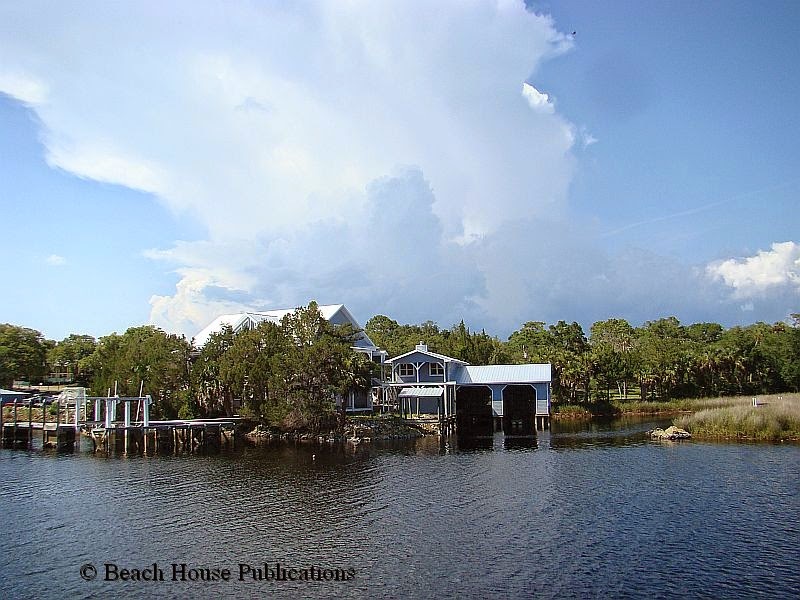 After St. George Island, it was time to visit Apalachicola. Our last visit here had been by car a couple of years ago, but we have also been here a couple of times by boat. 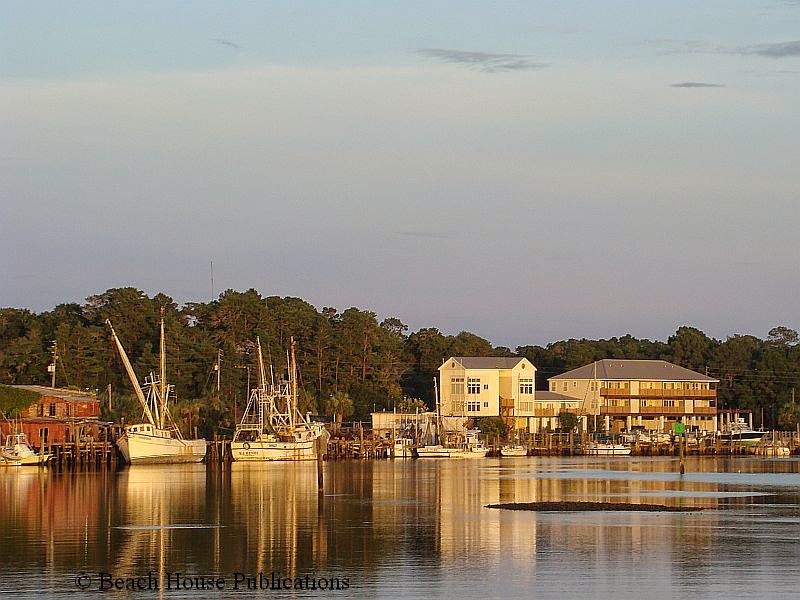 Apalachicola is one of those Florida towns that once thrived by the fishing and shrimp trade but fell on hard times when those industries declined. It has been trying to reinvent itself as a tourist destination and has succeeded somewhat. It's a funky, but fun town with lots of interesting shops and restaurants. There is a free municipal dock just inside the bridge that has some local boats filling most of the slips, but there is still room for a couple of transient boats. The cross current can be strong and makes getting into the slips challenging. There is also a day dock along the waterfront park and boats can spend the night, but there is a $30.00 charge just to tie up. There is no power or water. An alternative is to spend the day at the day dock, visit the town, and then move across the river to an anchorage just outside the channel for the overnight. If the anchorage is desired, there is a nice floating dinghy dock at the park. This is called The Wharf. From White City beyond Apalachicola, much of the rest of the Gulf Intracoastal Waterway will be new territory for us, since with our sailboat we had to go out into the Gulf because of the fixed bridges. This time it won't be a problem. Truly enjoyed your blog and videos of the gulf coast, river videos and info on panhandle was great. Looking forward to doing this in the next two years. Until then keep writing and i'll keep enjoying. Thanks.